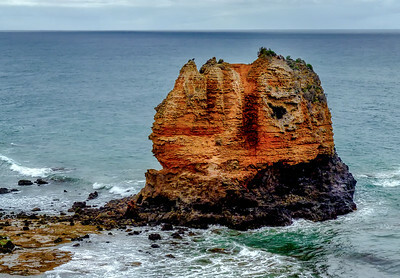 One of the most incredible coastal drives in the world, with awe-inspiring limestone cliffs and incredible rock formations, the Great Ocean Road really is a natural wonder. VIEWING OPTIONS: To enlarge images, click on either the featured image below or one of the thumbnail images . For full-screen images, view in slideshow mode. We don't always want bright sun in our photos. 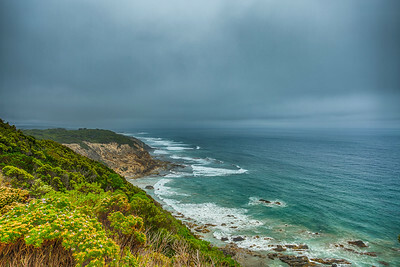 This view on a cold, cloudy summer's day conveys the rugged natural environment of the cost where it faces the western entrance to Bass Strait. 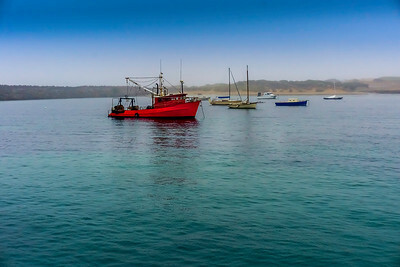 The Apollo Bay Fishing Fleet is moored at the harbour, sheltered by a large breakwater. This photo was taken at 6:55am. 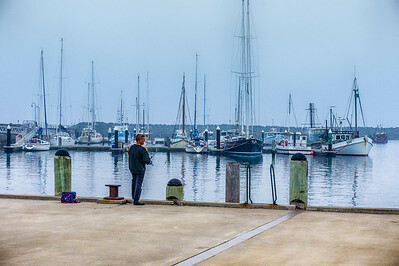 As a working harbour it is an interesting site to investigate and see the professional fishermen either unloading their catch or preparing to depart on another voyage to sea. 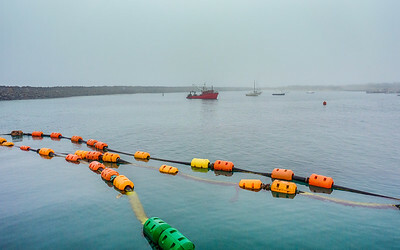 Apollo Bay is renowned for crayfish, and the stacks of lobster pots stacked up on the wharves make an interesting spectacle. 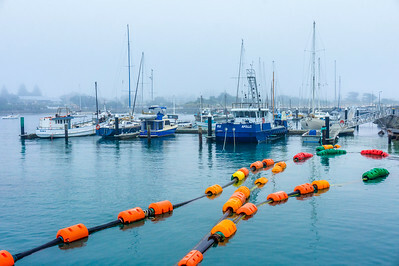 The daily catch is available fresh from the boat at the local fishermen's cooperative. 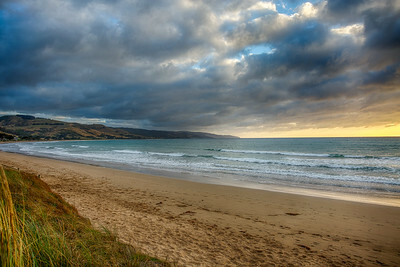 An early morning view of Apollo Bay looking north-east. At this time of morning, few people are on the beach. But as the day warms up this becomes a popular stretch of sand on which to stroll or jog. 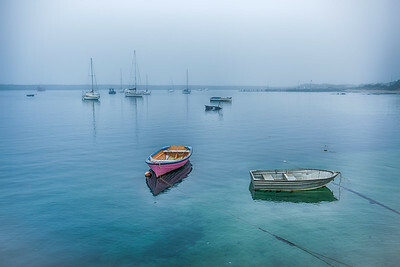 A nostalgic view of small craft floating patiently in the harbour to fulfil their destiny. 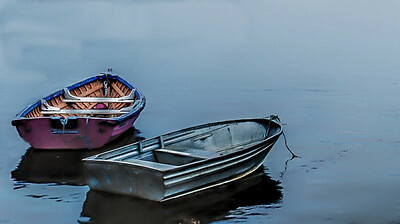 These small wooden boats are tied to the concrete jetty. 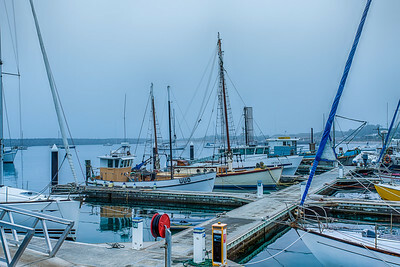 Likely, they are used to take people and supplies out to the boats anchored in the harbour. 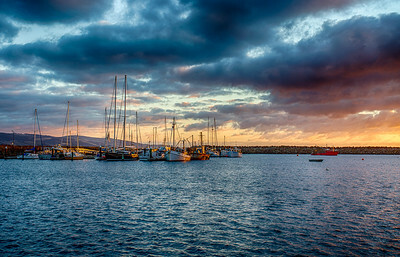 The lapstrake construction of these boats, called tenders, harken back to a former time before fiberglass and resins became the favored method of construction. "Is it so nice as all that?" asked the mole, shyly... "Nice? It's the only thing," said the Water Rat Solemnly, as he leaned forward for his stroke. "Believe me, my young friend, there is nothing -- absolutely nothing -- half so much worth doing as simply messing about in boats." This view provides more detail on the construction of the wooden tender. 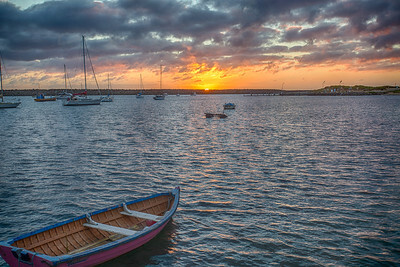 I would have loved to get into her, place the oars in their locks and explored this lovely harbour. I fondly recalled my small English Pram, a smaller but similarly constructed tended I owned. It gave me hours of pleasure and adventure. I spoke with this man who had caught a few squid. He told me he didn't eat squid, but that they made good bait for gummy sharks. 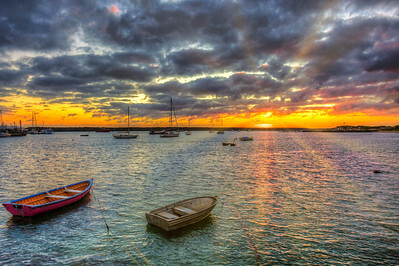 Whether you are a fisherman or a sailor, this photo appeals to any who love being on the water. I'm not sure what purpose the floats serve; perhaps a barrier marking shallow water. However, regardless of their intended purpose, they provide a colourful component to this photo. 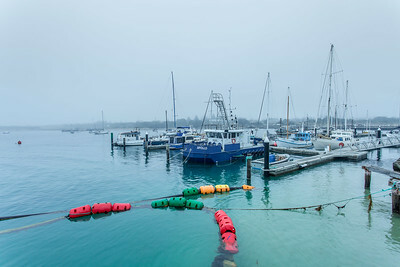 Apollo Bay Boat Harbour is one of only three deep water shelters along the Victoria coast stretching east from Port Phillip Bay. 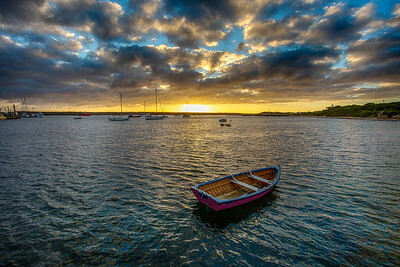 I can't imagine painting a boat brilliant red, but it sure makes for an interesting photo. Looking south-east to the start of Bass Strait from the Cape Otway Lightstation. The couple walking on the beach below provide an indication as the height of the bluff above the beach below. Another view looking east to the start of Bass Strait. Looking west, this is the Great Southern Ocean. 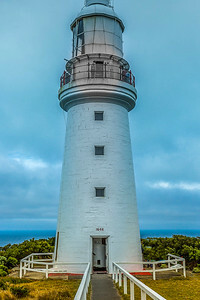 CAPE Otway Lightstation is the oldest, surviving lighthouse in mainland Australia. 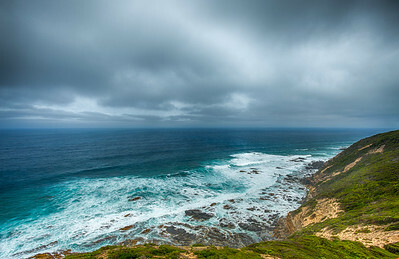 The light, which has been in continuous operation since 1848, is perched on towering sea cliffs where Bass Strait and the Southern Ocean collide. For thousands of immigrants, after many months at sea, Cape Otway was their first sight of land after leaving Europe. We travelled along the Great Ocean Road and were in awe of the many beautiful vistas along the way. 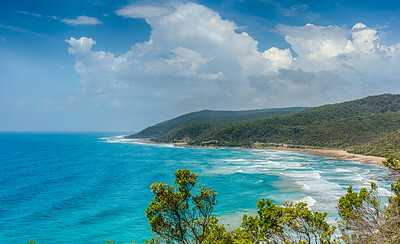 This shot looks west just beyond the little town of Lorne. 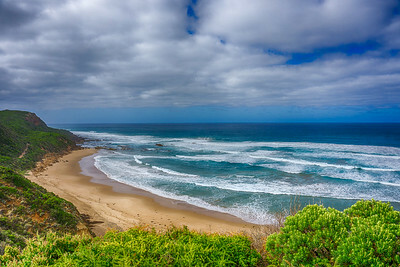 The Great Ocean Road is Australian National Heritage listed, a 243 kilometres stretch of road along the south-eastern coast of Australia between the Victorian towns of Torquay and Allansford. 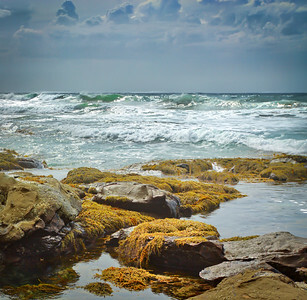 The formation process usually begins when the sea attacks small cracks in a headland and opens them. The cracks then gradually get larger and turn into a small cave. When the cave wears through the headland, an arch forms. Further erosion causes the arch to collapse, leaving the pillar of hard rock standing away from the coast—the stack. Eventually, erosion will cause the stack to collapse, leaving a stump. This stump usually forms a small rock island, low enough for a high tide to submerge. 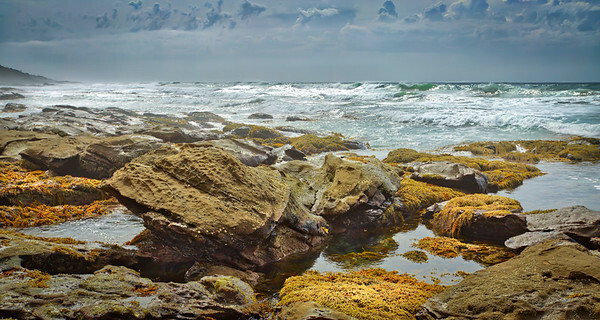 Not all the southern Victorian coast is sandy beach - stretches like this are very rocky. 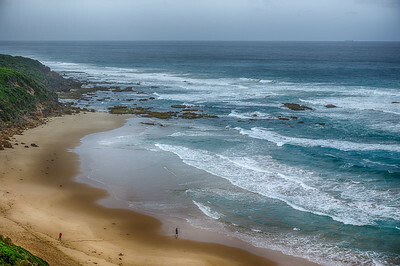 The surf breaks about 100 metres offshore. Surfing is not safe or good at this location. Sometimes the vista is simply too vast. Here's a close up taken from the previous capture.